Dr. Basit is actively involved in research, teaching, consultancy, and training for nineteen years. He received his PhD in Management (Organizational Behavior and Human Resource Management) with distinction from Universiti Kebangsaan Malaysia (UKM), Malaysia. He was a recipient of Malaysia International Scholarship, which is a highly competitive scholarship for foreign students awarded by the Ministry of Education Malaysia. Further to his credit, he received several awards at the completion of his doctorate, including Best PhD Student in Management Award, Best PhD Student of the Year Award, Excellent Thesis Award, and Graduate on Time Award. Dr. Basit has presented his research in various peer-reviewed journals and international conferences. He holds memberships of world’s most prestigious associations of management scientists and academics, including Academy of Management, USA and Society for Industrial and Organizational Psychology, USA. Recently, Dr. Basit’s research paper for the 2016 Academy of Management Meeting has been selected as a best paper in the field of Organizational Behavior. Dr. Basit is an HEC Approved PhD Supervisor. He has supervised several MS/MPhil theses and has been mentoring doctoral candidates. 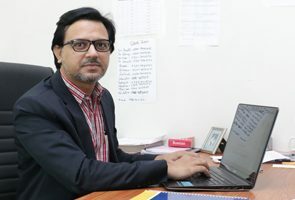 He has taught a variety of courses at the postgraduate and graduate levels, such as Seminar in Human Resource Management, Global Human Resource Management, Organizational Development and Change Management, Organizational Behavior, Human Resource Management, Recruitment and Selection, Management Information Systems, and Business Ethics. Dr. Basit has served at University of Management and Technology as Director of MS Management and Professional MBA programs. Earlier, he has served at GIFT University as Head of GIFT Business School and Director of Undergraduate Programs. Prior to these, Dr. Basit worked at Trisoft Consulting Inc. as Software Engineer and at Pacific Leasing Company Limited as Operations Officer. As consultant and trainer, he has worked with several organizations, such as Shaukat Khanum Memorial Cancer Hospital and Research Centre, Microtech Laboratories, Al-Rehmat Textiles, and Pepsi Naubahar Bottling Company. Basit, A. A. (In press). Trust in supervisor and job engagement: Mediating effects of psychological safety and felt obligation. The Journal of Psychology. Basit, A. A., & Chauhan, M. A. H. (2017). Psychometric properties of the Job Engagement Scale: A cross-country analysis. Journal of Management and Research, 4(1), 1–14. Basit, A. A., & Arshad, R. (2016). The role of needs-supplies fit and job satisfaction in predicting employee engagement. Jurnal Pengurusan, 47, 3–12. Basit, A. A., & Arshad, R. (2015). Effects of needs-supplies fit and demands-abilities fit on employee engagement: A case of Malaysian public university. Global Management Journal for Academic and Corporate Studies, 5(2), 12–19. Basit, A. A., & Arshad, R. (2013). Needs-supplies fit and job satisfaction: The mediating role of employee engagement. Proceedings of the 1st CHREST International Conference on Labour Market Transformation and Human Resource Development (p. 106–16), Kuala Lumpur, Malaysia. Basit, A. A., & Arshad, R. (2012). Effects of needs-supplies fit and demands-abilities fit on employee engagement. Proceedings of the National Research and Innovation Conference in Social Sciences (p. 785–97), Melaka, Malaysia.